The video : Learn programming 67: Circular motion: sine and her cousin_. I'm not to sure if this is going to be to much work, but I would like the fourm to take a little peek. float x0 = map(sin(a), -1, 1 2-, width -20) -- math.sin ? @kendog400 To post code correctly, put ~~~ on a line before and after the code. I added them to your code above. Maybe instead of posting code that someone has to convert to Codea, you can convert it yourself. That would be a great way for you to learn how to use Codea. If you run into trouble, just ask and you'll get a lot of help from us. That's how a lot of members learned how to program Codea. They wrote small programs and then increased the size as they learned more. @kendog400 Here a Codea version. Change the slider values to change the design. Here's a version with 3 lines and colors. The code is not to long. Here’s a link to the site just in case someone else wants to see it. It’s interesting because it has different programs that can be run. It would take some work to convert the code to Codea in some of the examples, but it might be an interesting way to learn. @kendog400 Here’s something similar. It takes about 5-10 seconds to create the image. If the programs crashes, reduce the number 40 in the statement for z=1,40 do in setup(). I had nothing better to do so here’s a program that draws 20 3D Bézier curves between 2 red balls. It takes 5 to 10 seconds to create the image. For another image, press the restart icon and wait another 5 to 10 seconds. Just sitting on the couch watching the Olympics. Thought I’d throw this together. It takes a few seconds to load. @kendog400 Just as the error message says, you need to include Craft as a dependency. The next error message you would get is to include Cameras as a dependency. Because these programs use Craft code, you need to check Craft and Cameras from the dependency list for the programs to run. I think I’m lost, how do you include cameras & craft as a dependency ? I think I got it now...thanks ! Here’s a variation on my 3D Bézier code above. @dave1707 nice! if you could implement true 3d tubes that would be great- it is something i’ve wanted for a long time! @piinthesky You can create 3D tubes. Here an example of a square tube. 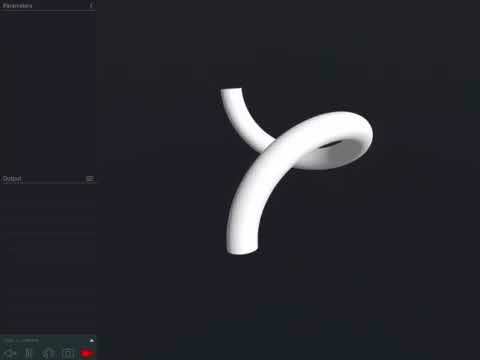 You could probably create a circular tube, but I didn’t want to spend that much time trying to do it. @piinthesky I did a little more work on the 3D tube. Here’s a better example. You can change the number of sides to alter the roundness of the tube. You can also change the length len of the tube and the diameter dia. thanks @dave1707 - very nice! Could be interesting to combined it with your bezier curves program to have 3d tubes that follow the path of the bezier (or a list of predefined 3d coordinates). @piinthesky I don’t know how much trouble there would be connecting the tubes. Maybe I’ll have to try. Most of the necessary code is actually in the Roller Coaster project as that works out all the directions (normal and binormal) along the path which are needed to make the segments fit together. Once that's in place, making the tube fit is quite straightforward. @LoopSpace Nice Example. I looked thru the Roller Coaster Example, but there’s a lot of code to go thru. Do you have anything that works with Craft. I've extracted what I could. It needs the PseudoMesh and MeshExt code from my Graphics Libraray. The code would be slightly simpler if using the VecExt code from my Mathematics Library but I've copied the relevant stuff in. The way it works is to create a table of points along the path (this version uses the parametrisation - the one used in the Roller Coaster uses arc length but that's harder to compute). It also computes the tangent vector at each point, and it keeps track of a normal vector (the method by which it does that is slightly complicated). These vectors can then be used to construct a cylindrical segment from each point to the next with axis along the curve. The cylindrical segments can have end faces not parallel so it can cope easily with the curvature of the curve. I used a helix rather than a bézier curve for no good reason. @Loopspace - problem with cimport, which can’t find in the code above (apart from the call) or in the libraries you’ve mentioned. Is it part of Craft code? Craft and Cameras are used as dependencies. @Bri_G Sorry, the line with cimport should have been removed before pasting. I use @toadkick's cmodule for side-loading tabs from other projects. I meant to remove all references to it when I copied the code here but one slipped through, sorry. @piinthesky thanks for posting the video! Do feel free to ask anything about the code. Hi guys, sorry to be a pest on this but - I was using PseudoMesh an MeshExt and I even added the VecExt to try to get it working. Commented out the cimport but still no joy. Removed VecExt then moved PseudoMesh tab to left then no errors, but just a black screen. Left for about 30 secs still no image. I’m missing something. @Bri_G I loaded it and it works fine. Image pops up in about a second. I reloaded the code @LoopSpace posted above. I put PseudoMesh in a tab called PseudoMesh. I put MeshExt in a tab called MeshExt. When I ran it I got an error and I think I had to take the local off of PseudoMesh = class(). Post again if it doesn’t work and I’ll delete it and try loading all of it again and see what happens. Can’t understand this, recouped all three tabs, with and without local on the PseudoMesh = class(). Bother dependencies on and main tab in middle. Just a black screen. Have just updated to iOS 11.26 - no effect. @Simeon - just noticed a funny on my iPad, held my touch on Codea icon and it brought up several images from my Dropbox, pressed see more and it showed more images. This occurred after doing a backup to my Dropbox. Can’t understand this, repasted all three tabs, with and without local on the PseudoMesh = class(). Bother dependencies on and main tab in middle. Just a black screen. Have just updated to iOS 11.2.6 - no effect. @Bri_G I loaded everything again and it worked. So here’s the steps I took. Copied the code from above and pasted it into a new project. Selected RAW and copied the code. Ran program and image appeared in about 1 second. If no errors and nothing shows, put 2 fingers on the screen and move them together. Maybe the image is off to one side and pinching the screen will move the camera farther from the image and maybe it will show. 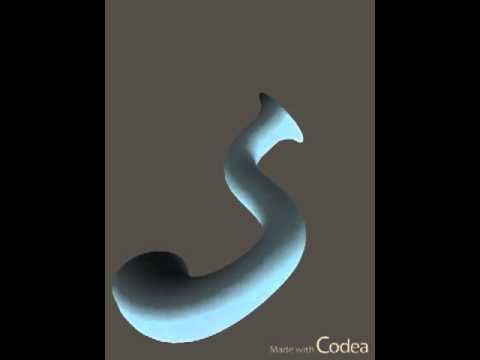 @Bri_G As for long pressing on the Codea icon, I mentioned that in the Codea 103 discussion. For me, it shows files from the Files app. Here's the code in one file, with most of the unnecessary stuff removed. @Loopspace, @Dave1707 - thanks for the help on this, uninstalled Codea then reinstalled and synced my Dropbox - an hour later followed @Dave1707 stepwise breakdown - still got an error, moved PseudoMesh before Main and lost error but just a black screen - just like before. Copied @Loopspace code across and ran perfectly - very impressive and very fast. Thank you. On an aside, after dumping all my code I started to set up collections to tidy up the code when I re-install all projects and noted @Simeon has added collapsible collections - thank you. Are these structures retained in a backup? @Bri_G What do you mean by collapsible collections. How, where? @dave1707 - when you use fileapp to look at the Codea folder in 103 things seem to have changed, but I need to check a few things first. One thing that I think is new is if you enter project folders(called collections) by creating folders in Fileapp e.g. utilities.collection then you will get a > symbol followed by that title in Fileapp. Whilst in Fileapp you can transfer projects into the utilities.collection and then see them on the Codea Project page by clicking on the > utilities.collection entry. This allows you to tidy up your projects, but it also makes it less onerous to scroll through the projects as, by clicking on the > utilities.collection you can alternately open and collapse that collection. I've set a 1Dependencies collection up and put the cameras in it, hoping I could see it reflected in the Dependencies list but no joy. I think we need the same management system on the Dependencies. Sorry about the delay in replying - had to recharge my pad. @Bri_G So it’s the Files app. I thought it was something new in Codea that I didn’t see. What would be nice is selecting a Codea project in the Files app, it switches to Codea and opens that project, lets you do whatever you want and when you close the project, it goes back to the Files app where you started. I don’t use the Files app for anything right now, but that might make things a little easier for those that want to group their projects. @dave1707 - it’s like I said, useful if you want to organise your projects - especially if you have many live projects. But you do need Backup to record the collection structure with the files to make this a really useful tool. Otherwise you are going to spend a lot of time shuffling projects. Here’s a variation to my code above that drew 20 Bézier curves using Craft spheres. This version draws tubes instead of the spheres. Some changes made by @LoopSpace. It takes several seconds for the image to show. Corrected some code and removed some code to improve the above program.